Use the Records Management Pre-Inventory Survey for performing an inventory of records throughout the organization. The survey gathers information about the business units, organizational information and regulatory information. look I wanted was already created, no need to reinvent the wheel - just use what was already there. The Proposal Kit folks already knew what would work and it did for us." This Records Management Pre-Inventory Survey is included in an editable format that can be customized for your own needs. The following are interviews conducted with key individuals who support the organization's records. What is the function of the business unit? What programs and activities does this business unit oversee? What business units are responsible for developing policies? Who will be the department liaison for the records inventory? What are the duties of staff activities? Where are most documents stored? What policies or individuals are tasked with managing content for this unit? Are policies and procedures current? Is there a document management system used by the department? Are records secure from loss? Are there external agencies that provide guidelines and feedback for regulations related to records? Are there any legislative requirements for creating or maintaining records? Are there guidelines for destroying records? Is the department subject to audits? Does the department have existing records management policies? Is there a departmental records retention schedule? Does the department have a classification or file plan? Does the department provide training to employees on record creation? What is the level of understanding for individual responsibilities regarding records management? 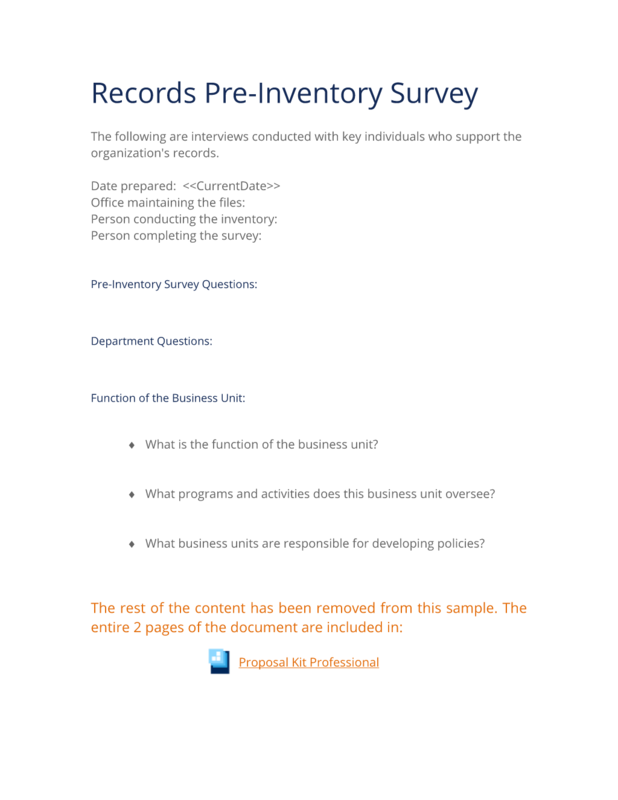 The editable Records Management Pre-Inventory Survey document - complete with the actual formatting and layout is available in the retail Proposal Kit Professional.